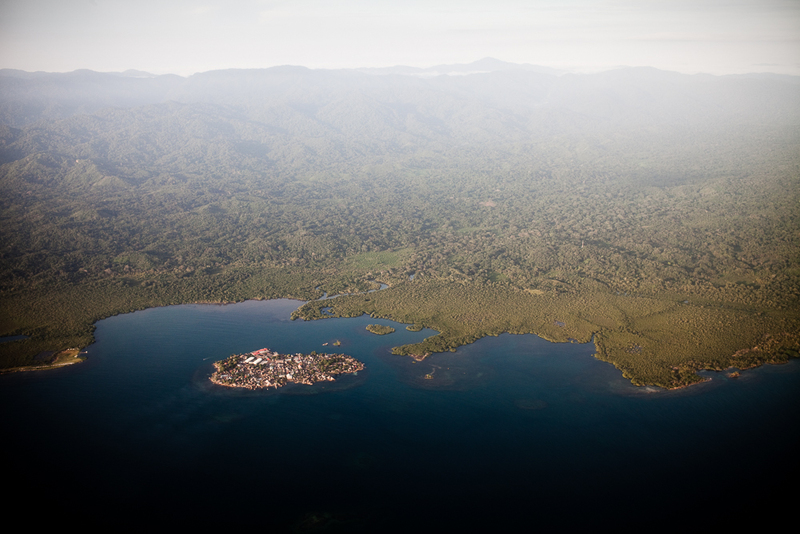 The Kuna Yala region is home to Panama’s healthiest forests. Photo by Bear Guerra. Ruxandra Guidi and Bear Guerra recently returned from a two-week visit to the indigenous communities of Kuna Yala, on Panama’s Caribbean coast. They were exploring the Kuna people’s relationship to their mainland forest, which is among the best preserved in the region. Their trip was supported by a Mongabay Special Reporting Initiative fellowship on the role of community forest management in efforts to limit climate change. A recent report by the World Resources Institute looked at deforestation and greenhouse gas emissions in the world’s most heavily forested countries. The researchers found that land held by local and indigenous communities tends to be significantly less affected by deforestation–and to produce far fewer emissions–than land managed by governments or private entities. Rux and Bear will publish their print, radio, and multimedia stories this fall. 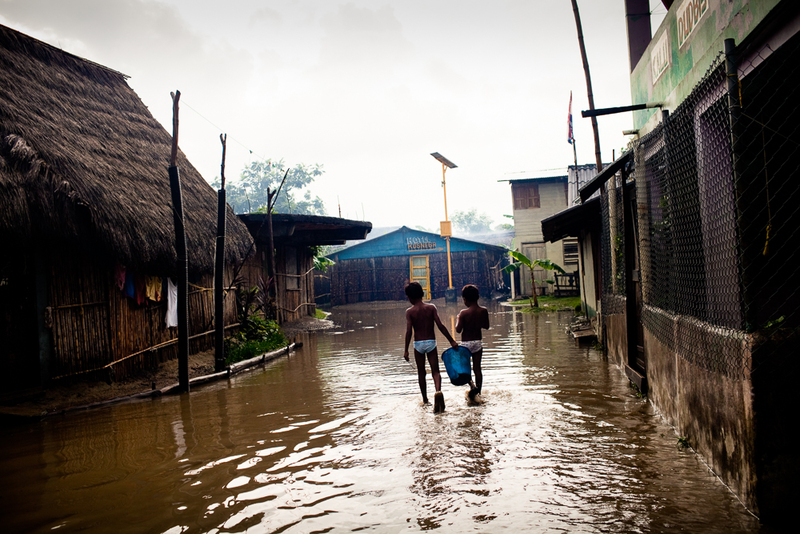 Children walk through floodwaters in Ustupu Island village in the Kuna Yala region of Panama. With sea levels rising and storms in the islands getting stronger, indigenous Kuna leaders are planning to relocate entire villages to the mainland. Photo by Bear Guerra. The environmental website Mongabay.org has selected Homelands producer-members Ruxandra Guidi and Bear Guerra for a Special Reporting Initiative award for their multimedia project on climate change and community forestry in Panama. 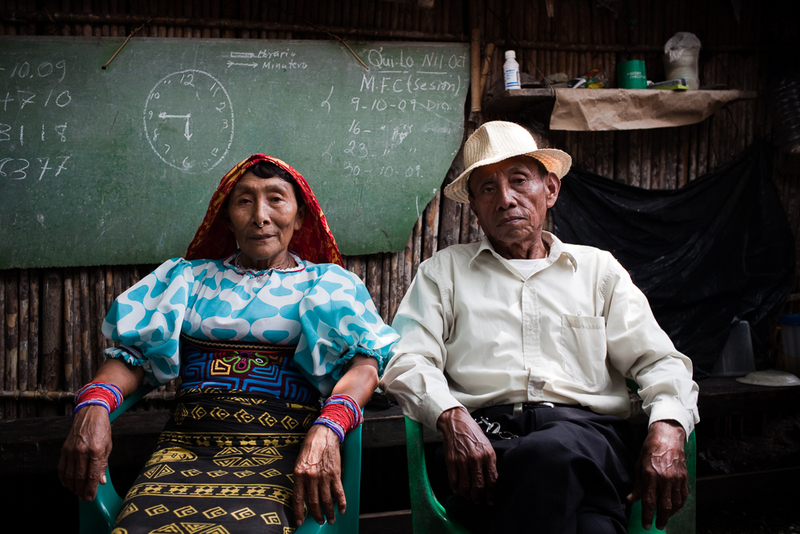 Ustupu Island chief Leodomiro Paredes (pictured with his wife, Imelda) says developed nations responsible for climate change should help pay for his people’s move. Photo by Bear Guerra. Ruxandra and Bear have reported from the area before, for The Atlantic. With support from Mongabay, they’ll return to do more reporting this spring and summer. They plan to publish their work later this year under a Creative Commons license. Other winners of Mongabay’s Special Reporting Initiative awards are Robert Eshelman for his look at deforestation in Indonesia and Dominic Bracco II and Erik Vance for an investigation of sustainable fisheries in China. Radio and print journalist Ruxandra Guidi and photographer Bear Guerra joined Homelands as producers and board members in February. They co-founded the multimedia group Fonografia Collective. Homelands senior producer Cecilia Vaisman, Magnum photographer Susan Meiselas and the production team at Magnum in Motion have created a powerful multimedia feature about the struggles of farm workers to meet their basic food needs as they grow older. “A Harvest Out of Reach” is the third part of AARP’s “Hungry in America” series about food insecurity among seniors. A Spanish language version is also available. The first two stories—”A Little Goes a Long Way” (by Jonathan Miller and Christopher Anderson) and “Hard Choices” (by Sandy Tolan and Larry Towell)—were also collaborative efforts between Homelands producers and Magnum photographers. A fourth and final piece is on its way.